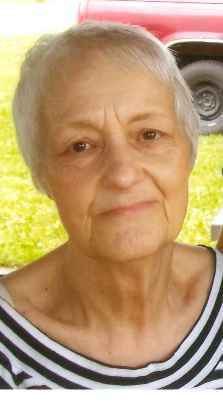 Annette D. Stacy, 85 of Fremont, OH passed away on Friday, September 8, 2017 surrounded by her family at Elmwood Assisted Living in Fremont, OH. She was born on September 19, 1931 in Freeburn, KY to Lawrence and Juanita (Francis) Childress. Annette married Delone Stacy on December 12, 1949 in Pikeville, KY and he preceded her in death on May 4, 2012. She worked for Temple Tot School in Housekeeping for fourteen years, retiring in 1993. She was a member of Fremont Baptist Temple. Annette was an avid Ohio State and Pittsburg Steelers fan. She enjoyed meeting and spending time with all of her new babies in the family. Annette is survived by her children, Kathy (Tom) Lozier, Green Springs, OH, Danny (Diane) Stacy, Gibsonburg, OH, Debbie (Jerry) Good, Fremont, OH and Gina (Alan) Perry, Old Fort, OH; son-in-law, Sam Pride of Tennessee; siblings, Wanda Mitten, Janice Bowersox, both of Fremont, OH, Jackie (Roy) Trivitt, Highland Springs, VA, Steve Childress, Harriman, TN, Terry Childress, Nashville, TN; sister-in-law, Sheila Childress, Knoxville, TN; sixteen grandchildren, twenty-six great grandchildren and six great great grandchildren. She was preceded in death by her parents; husband, Delone Stacy; daughter, Melissa Pride; sister, Portia Colwell and brother, Johnny Childress. Visitation: Tuesday from 2 to 4 p.m. and 6 to 8 p.m. at Wonderly Horvath Hanes Funeral Home and Crematory, 425 E. State St, Fremont, OH. Service: Wednesday, September 13, 2017, 10:30 a.m. at Fremont Baptist Temple, 1150 S. CR 198, Fremont, OH with Rick Ash officiating. An hour of visitation will take place prior to this service. Memorials can be made in honor of Annette to Hospice of ProMedica Hospital. So sorry for you loss. But she is in a better place and she is by be your side proyecting and loving you always. So very sorry for your loss. May God bless you and your family. I’m so sorry for your loss. She was a wonderful woman and I had the pleasure of working and caring for her. Certain times she would have a smile on her face and some days were better then the rest. She was beautiful inside and out. And she will be truly missed. May God bless you and your family. Aunt Annette was a devoted, kind, faithful woman. She kept a smile on her face through the storms. A beautiful family with all the children and great, great great. I am amazed at all the great great grand children. WOW! I am Delong’s cousin in Bristol, Tn. I stay in touch with the ones nearby. Sorry for your loss.